We’re in a the golden age of the drum machine, whether it’s dedicated hardware or a computer or a mobile gadget. Of course, that means it’s getting tougher to stand out. Patterning is one of the most promising software entries yet. I’m already a huge fan of Elastic Drums for its rich approach to timbre – this could be my other fast favorite. 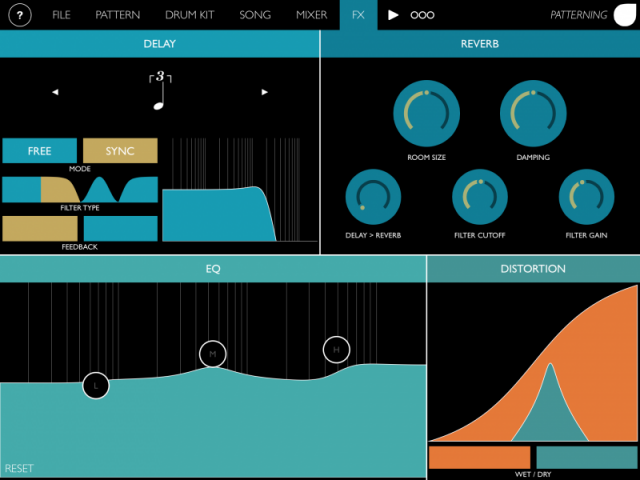 Patterning side-steps the two problems with most drum machines – boring, regular patterns, and boring, predictable sounds. 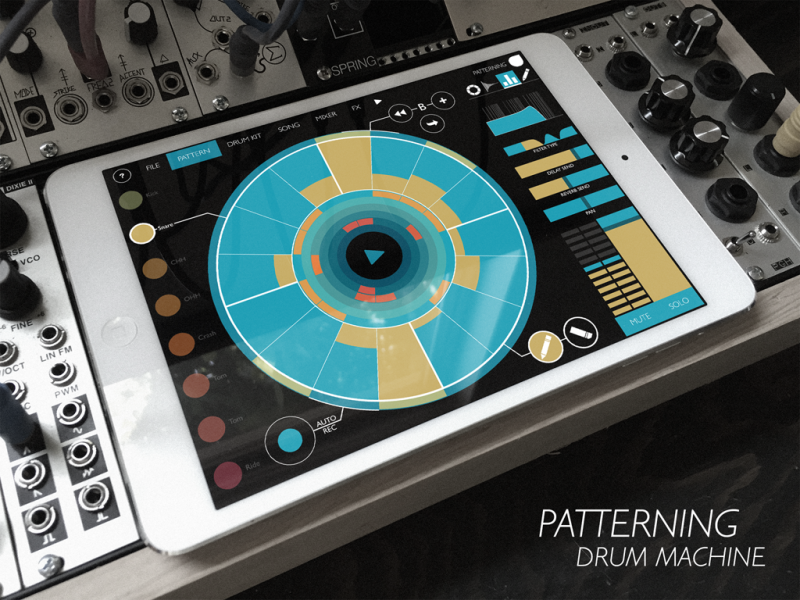 Patterning’s user interface is centered around a circle, as cycles of time repeat in futuristic rotating colored geometries. We’ve seen that before, but Patterning makes it both uniquely accessible and uniquely powerful. Finding four-on-the-floor is easy, but so, too, is creating complex polyrhythms. For sounds, you can load up your own custom kits, to keep this from sounding like everyone else (well, unless you want some 909 action and you do want to sound like everyone else intentionally). There are deep effects, too, plus the complement of MIDI and audio routing features serious iPad musicians now demand. Yes, it does Euclidean rhythms – of course. 1-64 steps, 1/32nd note to whole note with dotted and triplet options, 64-bit velocity. Loop modes: forward, reverse, a specialized random feature (Urn), “pendulum,” auto-rotate. Automation layers, draw and erase. Repeat patterns with the “Pen Echo” mode. Use built-in samples (63 kits there already), or import from Dropbox, Audioshare, iCloud, or iTunes File Sharing. Mixer: per-track multimode resonant filter, plus delay and reverb sends, panning, mute/solo. Effects: delay with feedback and optional tempo sync, 3-band EQ, distortion, reverb. 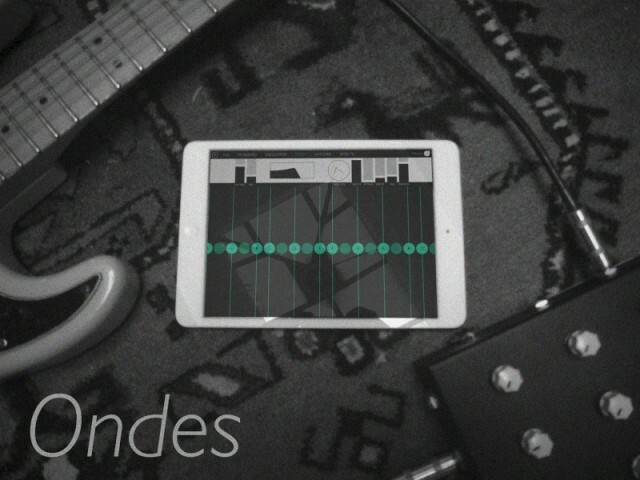 Audiobus, Inter-App MIDI, Core MIDI. 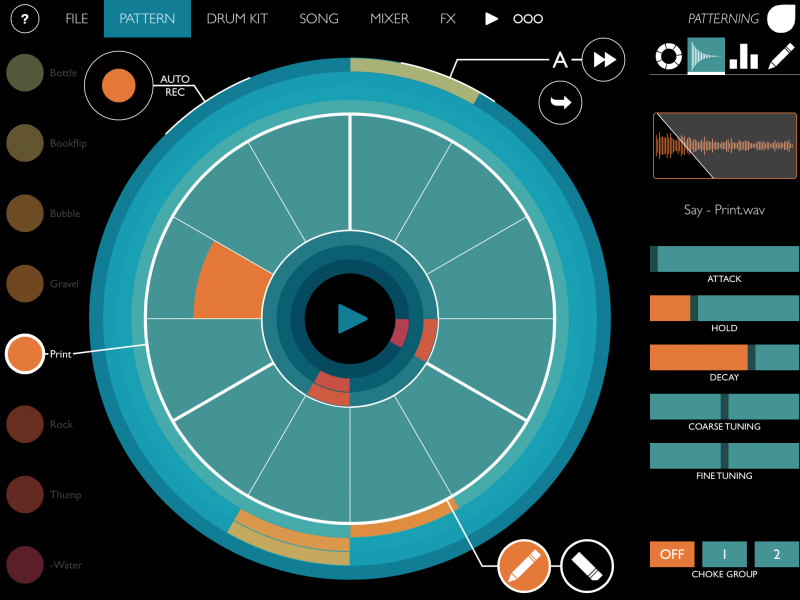 There’s a song mode, too, in which patterns can become larger structures, with some powerful options (time signature, snap, jump, and so on). Drum and sample kits look like a big part of how this thing will grow. 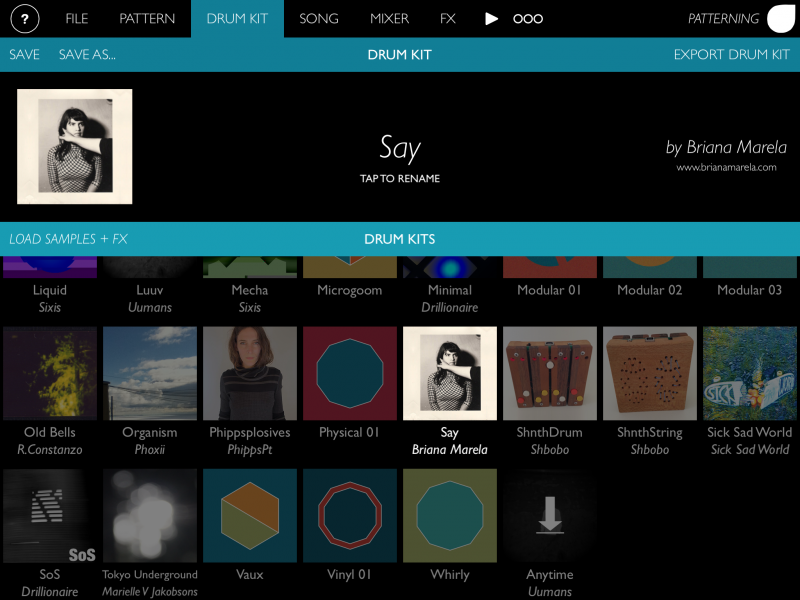 You’ll be able to acquire new sounds via in-app purchase, and even bundle up kits to share with others. And while you’re picking up Patterning, don’t miss the half-off sale on the lovely Ondes, which presents an expressive, Martenot-inspired way of playing instruments on a tablet.